How do you blend a whisky? How often do you think about how your whisky is made? Sure, the concept of distilling and maturation is probably lingering somewhere at the back of the brain, but what about the hands-on work involved in making sure the dram you’re nursing is crafted exactly to the way you’ve come to know and love. That’s where Chivas steps in. 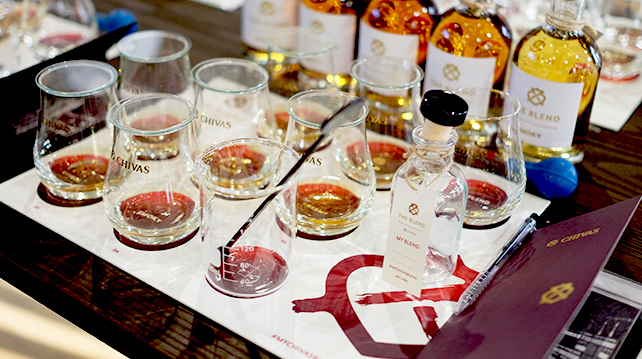 Leaning on their history as the original pioneers of luxury blended Scotch whisky, Chivas presents a global initiative called The Blend where anyone can attend to learn about how a blended whisky is made and take home a little one of their own. Here in Malaysia, the session is run by the incredibly knowledgeable brand ambassador Jasper Epsom in a class that’s equal parts scientific precision and culinary fun. Chivas Regal is a blend of the finest malt and grain whiskies, overseen by the Master Blender in a process that is more like an art than anything else. And while the original work is complex and requires many years of mastering, The Blend is able to break it down to its most basic elements for the average consumer to get a proper appreciation of the magic involved. Epsom first took us through a tasting of the five core flavour profiles – floral (a grain whisky), fruity, creamy, citrus, and smoky (all single malts) – to properly understand the aromas and notes of these ingredients, as well as to get a feel of our personal palate. In reality, the Master Blender would laboriously nose and sample hundreds of whiskies and malts in a session, to be sure he creates the exact perfect blend. Then, the fun part – the blending began. With a pipette and a beaker (this is the science bit), we played around with proportions and flavours to create our signature blend. Epsom’s only recommendation was to start from a base of 50ml of the floral grain whisky for a lighter profile, if we were heading in that flavour direction, but otherwise gave free reign. Most of the guests took generously from the fruity, creamy, and citrusy malts, being extra careful with the smoky malt and the intense peaty taste. Epsom would occasionally check in to offer advice, but when we were finally happy with our blends we transferred them into a small 100ml flacon, ready to be taken home together with a diploma for programme completion. The tagline for this event is ‘success is a blend’, a sentiment that clearly works for Chivas as they open up and share with their customers how they make their magic. And while this was indeed a somewhat simplistic overview, it gave engaging and informative insight to the blending process that even a casual whisky drinker could appreciate. Puff away to win a spot at the Grand Final in Split, Croatia. Anthony Walkenhorst, the Chief Winemaker of Kim Crawford, shares his best known secret in the art of wine blending.